In the 1800s, Satan hatched “the ideas of evolution, socialism, Marxist-socialism (Communism), progressive education, and modern psychology” to counter America’s increased religiosity. The books sympathize with the South in regard to the Civil War or “war between the states," as they phrase it, and while the acknowledge that slavery was likely a factor in the war, they emphasize other explanations. These types of ideas were promoted in three particular textbooks/curriculums. The charts below reveal the frequency with which voucher and tax credit schools use these textbooks. Increasingly forgotten in these conversations [about school choice] is that the purpose of receiving an education, at least a public education, goes far beyond the teaching of information and skills and the interests of individual students. Public education includes the transmission of social values that lead to social cohesion and the overall betterment of society. Test scores tell us nothing of these values, and private markets are ill suited to deliver them. Whereas private markets respond to consumer preferences, public education seeks to create public preferences. Additionally, given the nature of the democratic values our public education seeks to promote, individually responsive education makes little sense. Public education entails the provision of common experiences under conditions consistent with equal protection, due process, free speech, and religious neutrality. A consumer-based system allows for too much educational variation and opens the door to individual biases that are contrary to public education. Based on their track record thus far, charters and vouchers, on the whole, are not operating in furtherance of the public good. Rather than promote the public good, they tend to promote the individual good and operate in ways that actively undermine the public good. Consider, for instance, an individual-orientated education system that includes elements of school choice. Such a system potentially caters to antisocial behaviors by permitting students with shared antisocial values to choose to coalesce in particular schools or programs. Over the long term, this type of system would undermine social cohesion and counteract the effect of social pressures that might otherwise produce common values. In contrast, many of the specific values a collective-based concept of education seeks to facilitate are those that mitigate and limit individuals' tendency to adopt antisocial or group mindsets and act on them. For instance, collective-based education promotes the individual's commitment to enhancing the public sphere and common good. Because individuals tend toward self-interest, collective-based education seeks to counteract the tendency toward self-serving interests and affirmatively promote the opposite. Unsurprisingly, collective-based education can generate significant controversy in promoting these values, as doing so only highlights the tension between competing concepts of the public good. Some theorists define the common good not as a society with an expansive public sphere but one with unfettered individual liberty. Collective-based education generally agrees that a core set of individual liberties must be protected, but collective education limits individualism at the point that it seriously threatens group interests. This is not to say that collective-based education would deny individuals the freedom to adopt antisocial values. If our First Amendment jurisprudence teaches anything, it is that arriving at collective wisdom requires us to protect all individual's ideas, regardless of how repugnant we might find those ideas. And the Court has held that the same principles extend to public schools. Protecting individual freedom, however, is far different from requiring the state to adopt policies and structures that might facilitate and support antisocial values and behavior. At most, the state is obligated to allow individuals to opt out of the public system when their individual values are at odds with public values, but, even then, the state can place limits on the private pursuit of individual values when the private pursuits pose a significant threat to societal well being. Thus, the irony in Huffington Post's findings is not only are these schools teaching ideas that are at odds with the justifications for providing public education, the public is actually funding these ideas. Moreover, in doing so, these programs have the potential to undermine public education itself. I argued in 2013 that these programs could not just further individual choice, but give private individuals the ability to dissent and, as a practical matter, veto larger public policy agendas. For more, see the full article. Lakewood’s budget crisis is nothing new. The district lurches from year to year, making cuts in essential teachers, support staff, programs and services. The victims of this tragedy are the 6,000 Lakewood public school children. Virtually all are poor and 95 percent are Latino or black. Twenty-seven percent are limited English proficient and 15 percent require special education. The cause of Lakewood’s budget crisis is no secret. The district must not only support its public schools but it must pay to transport 30,000 students to private schools and pay for the cost of special education for many of those same private school students. The drain on Lakewood’s budget from non-public expenditures is enormous. The district is forced to divert nearly $13 million in funds earmarked for public school students to pay for non-public transportation. It also must shoulder $26 million in non-public special education costs. The state has the power to fix Lakewood’s budget crisis now. It doesn’t need new laws or changes to the school funding formula. Acting Commissioner Kimberly Harrington has the authority to restructure the budget so it provides Lakewood students a thorough and efficient education. And Lakewood’s state fiscal monitor, Michael Azzara, is empowered to override the board of education if necessary to eliminate the budget deficit. These state officials must act. First, they must halt the transfer of $13 million in public school funds to subsidize non-public transportation. Keeping those funds in Lakewood’s budget — where they belong — will stop the bleeding and allow the district to maintain essential services to its students. Second, they must take the operation and cost of special education to non-public school students out of the district’s hands. The state must assume full responsibility to approve and pay for special education in private schools. This would relieve Lakewood of a fiscal and managerial burden it simply can no longer handle. Let’s face it. The Lakewood budget has become nothing more than a vehicle for funneling vast sums of public school funds to pay for private and religious schools. This must end. Private school students are not constitutionally entitled to a thorough and efficient education. Only Lakewood public school children are. Voucher Mania Spreads to New Hampshire: Is This a Sign That Public Education Advocates in Other States Should Brace Themselves? That expansive voucher programs found a receptive audience in Nevada and Arizona's legislatures is not altogether surprising. When similar programs gain steam in places like New Hampshire, it is worth taking serious notice. The AP reports that a sweeping voucher bill breezed through the state's senate. "The legislation would allow any public school student to use roughly $3,500 in tax dollars to attend a private or religious school or use the money on homeschooling, tutoring or other expenses. It would be one of the nation's broadest school choice bills, similar to programs that have passed in Arizona and Nevada." Fortunately, the bill has slowed up in the state house. "The Republican-controlled House Education Committee is likely to retain the bill Tuesday, meaning it won't get a vote until next year." The governor has also expressed reservations. Even if this bill ultimately goes nowhere, making it this far is evidence that I underestimated the Trump administration's impact on education policy. 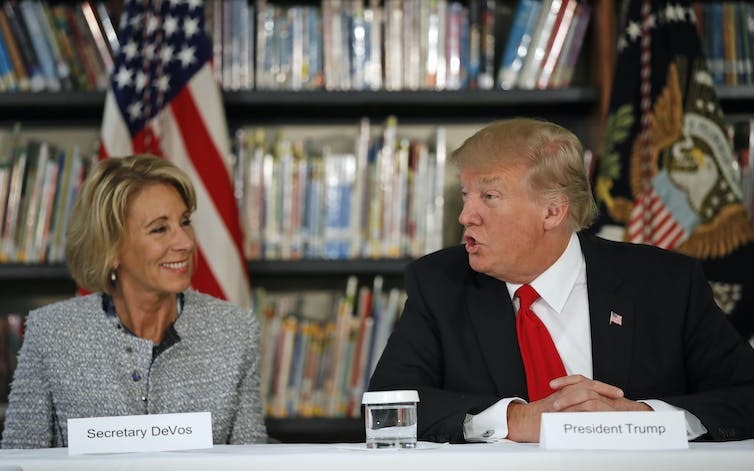 Given the current legislative structure at the federal level, the Secretary of Education has virtually no power to push an affirmative policy agenda. The Every Student Succeeds Act returns the lion's share of power back to states. Thus, my working assumption was that the Trump choice agenda would not have a perceptible effect on state policy. States disinterested in choice would ignore the administration. States that were interested would act, but not because of anything Trump or DeVos said. The quick spread of particularly expansive voucher programs, however, does not appear coincidental. The Trump administration did not give states the idea of expanding choice, but it appears to have emboldened them to do things they otherwise would have considered not possible or worth the effort. If New Hampshire can move a bill through its Senate, I am afraid there is a long list of other states that can go even further. Stopping that agenda will require local advocates to be prepared to defend the values that justify public education and not get caught off guard by what would normally be long-shot voucher bills. Gov. Brian Sandoval is pressing lawmakers to revive the private school voucher program blocked last September by the Nevada Supreme Court. The court ruled the program was unconstitutional because it would deplete funds earmarked by the Legislature to operate Nevada’s public schools. The governor’s bill, SB506, carries forward most features of the prior law. Sandoval wants the per-pupil amount spent on public school students, roughly $5,700, to be deposited into education savings accounts to subsidize private and religious school tuition and pay for other private education expenses. The governor also wants vouchers for any household, even the wealthy. And like the prior law, 100 days of public school enrollment is the only eligibility requirement. To get around the Supreme Court ruling, SB506 changes the way vouchers are funded. The funding will not come directly out of public school budgets. Instead, Sandoval proposes a separate appropriation of $60 million over the biennium. At that level, approximately 2,500 vouchers can be awarded each year, not enough for everyone who signed up under the prior law. So the vouchers will be given out on a first-come, first-served basis. Lawmakers should flatly reject the governor’s bill. And they need look no further than to Arizona for the reasons why. In 2011, Arizona enacted an ESA voucher program limited to students with disabilities. Once it got rolling, vouchers were expanded to include students in low-performing public schools. This year, 3,200 vouchers were funded by Arizona taxpayers, totaling $49 million. The vast majority of the voucher funds are used to subsidize tuition, fees and other expenses charged by religious and private schools. But Arizona voucher proponents weren’t satisfied. Cheered on by U.S. Secretary of Education Betsy DeVos, Gov. Doug Ducey recently signed legislation expanding vouchers again, this time making all 1.1 million public school students eligible. To pass the bill, proponents accepted a cap of 5,500 new students per year and 30,000 students over the next five years. The cost to taxpayers and the public schools could quickly swell to over $100 million or more. But make no mistake: Voucher proponents are already aiming to lift the caps and throw the program open to everyone. As in other states, Arizona’s voucher law lacks accountability. Private schools don’t have to administer the same tests as public schools, so there is no way to know if student outcomes are better. Oversight of voucher accounts is lax. A recent audit uncovered payments for groceries, games and gift cards using voucher funds. Like those who signed up for Nevada’s vouchers, most Arizona voucher recipients are from affluent neighborhoods, according to an investigation by the Arizona Republic. As a state senator who opposes vouchers noted, the expansion of vouchers will only spur the exodus of affluent white parents from the public schools, leaving those schools to educate students of color, poor students and English language learners with less money. And public school funding in Arizona, like Nevada, is among the lowest and most inadequate in the country. So Nevada legislators beware. Gov. Sandoval’s voucher bill is a Trojan horse. His $60 million for vouchers is just the start. Once voucher proponents get their foot in the door, they will follow the Arizona playbook, demanding expansion in the next biennium session. And, led by DeVos, they will not stop until they achieve their goal of taking down our public schools, without regard to the educational damage inflicted on the children left behind. For three-quarters of California charter schools, the quality of education on offer is worse than that of a nearby traditional public school that serves a demographically similar population. Taxpayers have provided these schools with an estimated three-quarters of a billion dollars in direct funding and an additional $1.1 billion in taxpayer-subsidized financing. Even the worst charter schools receive generous facility funding. The California Charter Schools Association identified 161 charter schools that ranked in the bottom 10% of schools serving comparable populations last year, but even these schools received over $200 million in tax dollars and tax-subsidized funding. At least 30% of charter schools were both opened in places that had no need for additional seats and also failed to provide an education superior to that available in nearby public schools. This number is almost certainly underestimated, but even at this rate, Californians provided these schools combined facilities funding of over $750 million, at a net cost to taxpayers of nearly $400 million. Public facilities funding has been disproportionately concentrated among the less than one-third of schools that are owned by Charter Management Organizations (CMOs) that operate chains of between three and 30 schools. An even more disproportionate share of funding has been taken by just four large CMO chains— Aspire, KIPP, Alliance, and Animo/Green Dot. CMOs have used public tax dollars to buy private property. The Alliance CollegeReady Public Schools network of charter schools, for instance, has benefited from over $110 million in federal and state taxpayer support for its facilities, which are not owned by the public, but are part of a growing empire of privately owned Los Angeles-area real estate now worth in excess of $200 million.